What springs to mind when you think about wall designs? Perhaps wallpaper, decals, stencilling? 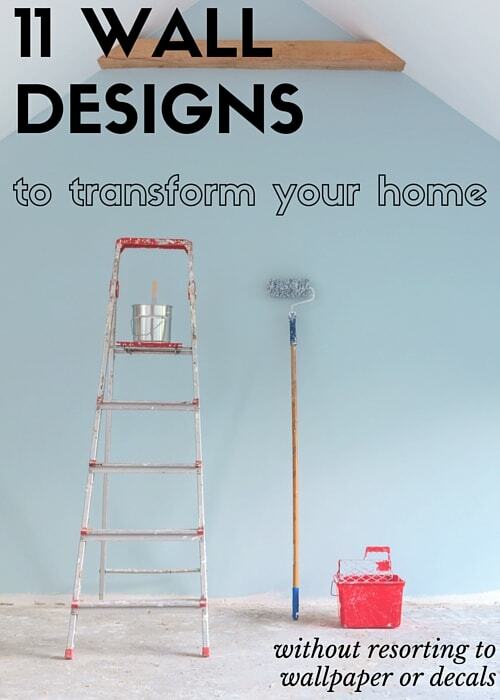 Yes, all very good ideas, all requiring a certain level of skill, and it’s certainly true that with the right creative designs you could produce some standout results from these classic techniques. But on the other hand, they’ve been done. And when you’re looking to create a stunning feature wall, you want something a little more than wallpaper and decals. How about one of these ideas? They’ve certainly piqued our creative interests, and hopefully you’ll get some inspiration from one or more of these ideas, too. Grown-up colouring has taken the world by storm. And unlike fads in days gone by (loom bands, puffer vests anyone?) grown-up colouring looks like it might here to stay. We’re guessing it has something to do with the mental health benefits of colouring, with many people finding a type of meditation benefit from this art form that requires no particular artistic skill and a minimal financial outlay. 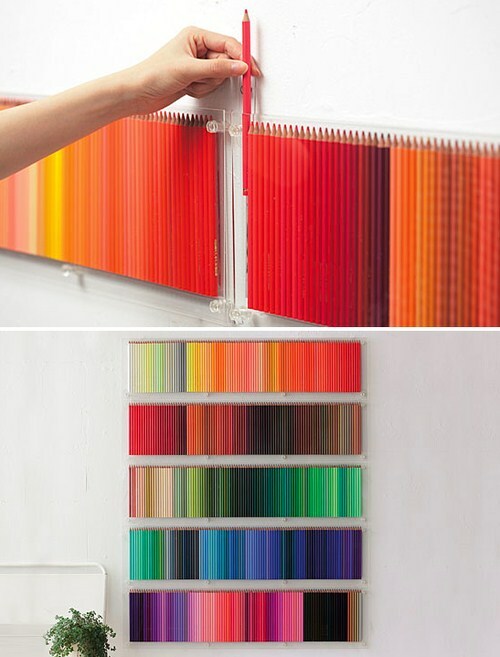 If grown-up colouring has taken over your life, let it take over one of your walls by creating a coloured pencil wall art display. If you’re aiming for a wall display of canvas prints, go big. Instead of just displaying three or four uniform sized photos, why not go all in and have a massive wall display of canvas prints? Consider grouping your prints by theme – with all of your wedding photos in one area, baby photos in another, and favourite holiday snaps together somewhere else. Canvas print gallery walls can literally stop traffic – foot traffic, that is. How many times have you found yourself drawn to a photo display – perhaps at a birthday party or wedding? By displaying photos on your walls, you are giving your guests an insight into your history and your private lives (to the extent that you choose, of course) as well as giving guests something to occupy their time during those sometimes awkward moments when you have to take a phone call or otherwise leave your guests unattended in your home. To spice up the gallery wall idea, make use of the often under-utilised area next to your staircase. This infographic cleverly guides you on how to position photos in the most aesthetically pleasing way along your staircase. It can be difficult enough to work out the perfect placement for prints of various sizes on a regular shaped wall, so this infographic could turn out to be a lifesaver when attempting to hang canvas prints beside a staircase without having the photos look terribly disorganised. String art is the perfect way to create a personalised message on your wall without requiring the help of a professional, or an exorbitant initial outlay. String art projects also turn out to be wonderfully hands-on and practical, without requiring a huge amount of artistic skill – perfect for the average person who would like to showcase a little creativity and who enjoys dabbling in DIY, but doesn’t consider themselves particularly artistic. 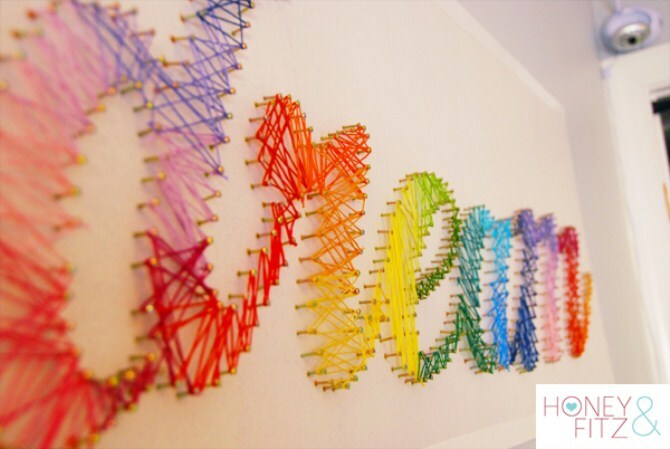 String art techniques could easily be used to display a child’s name on their bedroom wall, or could be used to showcase a favourite short motto or affirmation. This string art tutorial is wonderfully complete and accessible for the beginner, so we would highly recommend you check it out if you are at all interested in trying your hand at some colourful string art. For wall designs with the wow factor, continue your chosen wall display up onto the ceiling and beyond. Depending on the design and colours chosen, this technique can make your room seem longer, your ceiling appear higher, or in some cases: both. Do you have that one photo or image that you’d love to display on your wall? Perhaps it’s a photo that you took yourself during your travels, or perhaps it’s someone else’s photo of your favourite city’s skyline, a group of animals, or something else that speaks to you. 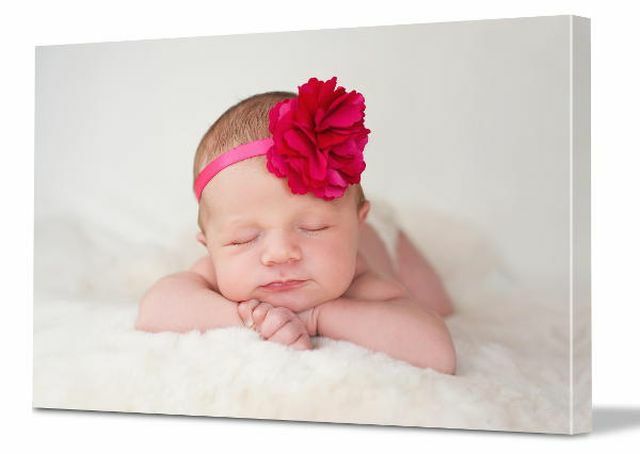 Rather than printing the image as one large canvas print, consider a split canvas display whereby your one perfect image is split over several prints for the ultimate in transformative wall displays. 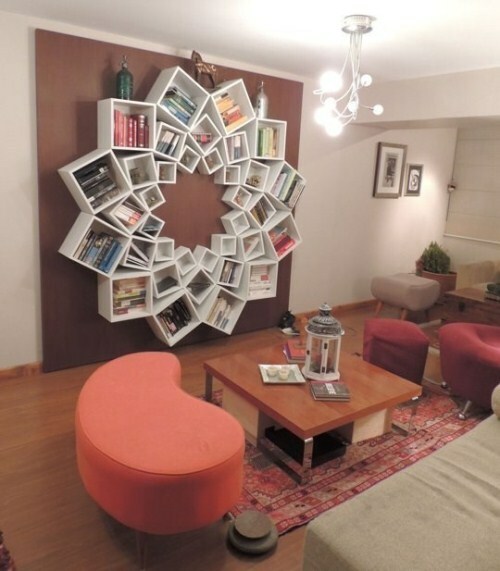 We all need somewhere to store our library of books, yet somehow backing a typical bookcase up to a wall can seem like a waste of a creative opportunity. Instead, think about how you can turn your mandatory book display into a creative masterpiece. We love this particular design for children’s books, as the small inner squares could easily house those tiny collections of picture books that children somehow manage to accumulate. 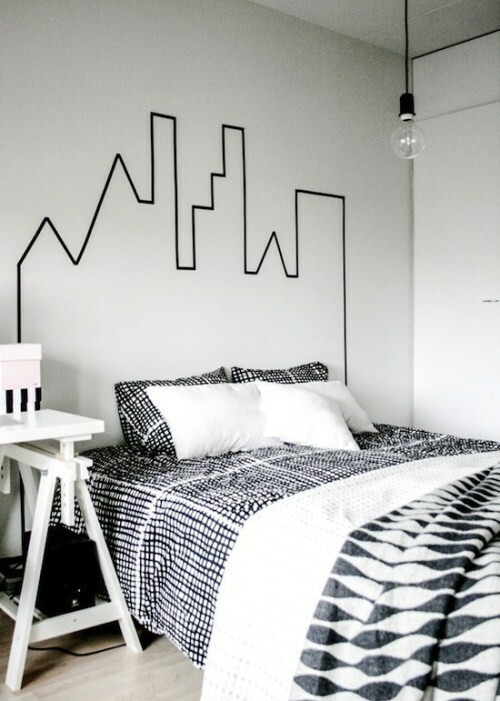 If minimalism is your style, create an effective skyline headboard on the wall behind your bed using nothing more than black masking tape and a steady hand. This DIY wall art project is not for the faint of heart, and will require an awful lot of wooden boards and a meter saw, as well as some basic maths skills to work out how to cut the exact angles required. From the looks of this tutorial, though, once you have everything set up it is a relatively simple matter of cutting as many pieces of board as required. The end result is undoubtedly stunning, so if you’re looking for a holiday project to completely transform one of your interior walls, this might be the way to go about it. 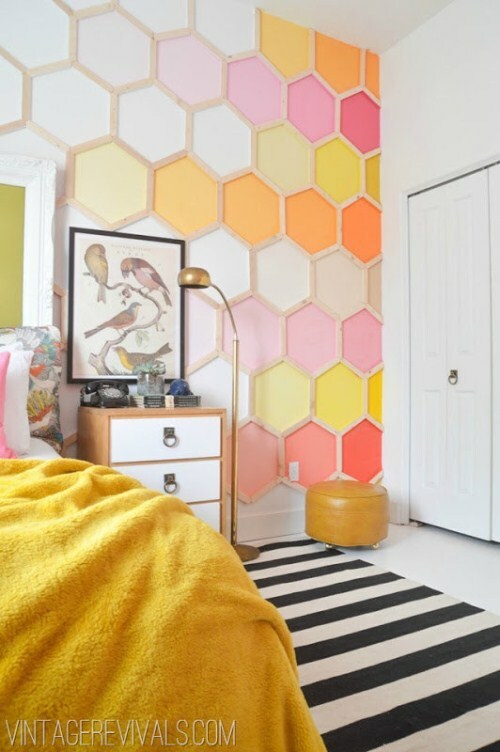 Many children would love the opportunity to create their own wall design in their bedrooms, but few parents are willing to let their children loose on their home’s interior walls with paint or any kind of DIY home maintenance tools. 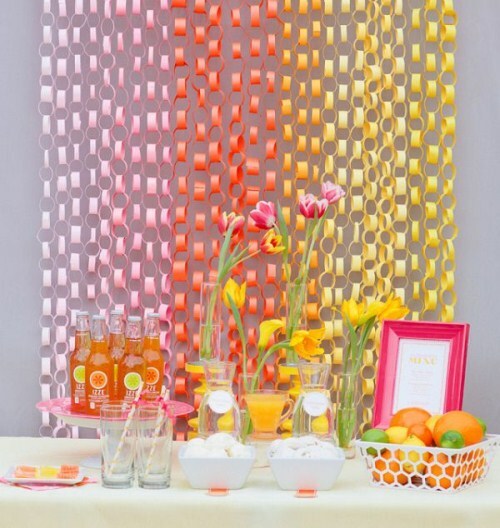 As a fun alternative, give your children free reign to decorate an interior wall by making a floorlength curtain of paper chain. All you’ll need to do is rig up a rod in the crevice where the wall meets the ceiling, and your children can be in charge of the rest of the project. To get them excited about the idea, promise that you won’t veto any of their colour choices, and encourage them to combine thick and thin paper chains for dramatic effect. You may just be surprised at what your kids will come up with! Sometimes the most stunning wall features are also the simplest. Make any wall stand out from the rest by featuring a giant sized single canvas print. Carefully positioned around your existing furniture (like being mounted on the wall behind a couch, or strategically placed opposite the main door in your entrance hall), an extra-large single canvas print can stun with its simplicity. Once you’ve committed to a DIY project, document your creative journey by taking photos every step of the way. Then, once you’ve completed your new wall design, create a before-and-after canvas print or a canvas collage documenting your journey. Ideally you can then hang your canvas print somewhere near your completed wall installation as of wonderful insight into your creative process.